New Zealand is a wonderful education destination for International Students. 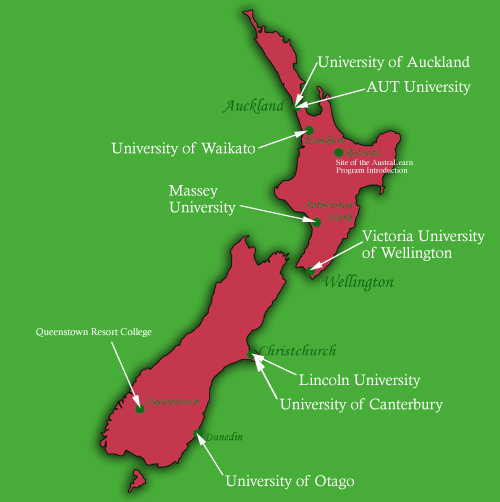 The peace and tranquillity, the scholarly study environment in Colleges and Universities and the wide choice of subjects to choose from the many Undergraduate, Graduate, Post Graduate and Doctoral Programs make New Zealand a student’s haven for acquiring world quality education leading to great career pathways in the future. New Zealand is located in the Southwest Pacific Ocean and consists of two main Islands as well as a number of smaller ones. The principal Islands are the North and South Islands which are separated by the Cook Strait. North Island has a mountainous center with many hot springs and volcanic peaks. South Island is much more mountainous with the Southern Alps, which has some 350 glaciers, running across the length of the Island. Much of the lowlands are broken and hilly while plains are not prominent on either Island. 2. Why Study in New Zealand? New Zealand has an international reputation as a provider of quality education. It has a progressive education system with many state of the art facilities. It offers a safe learning environment with excellent study opportunities and support services for international students. New Zealand produces top graduates who can take their place with confidence in the international arena in many disciplines. Education in New Zealand offers an attractive and stimulating academic environment. 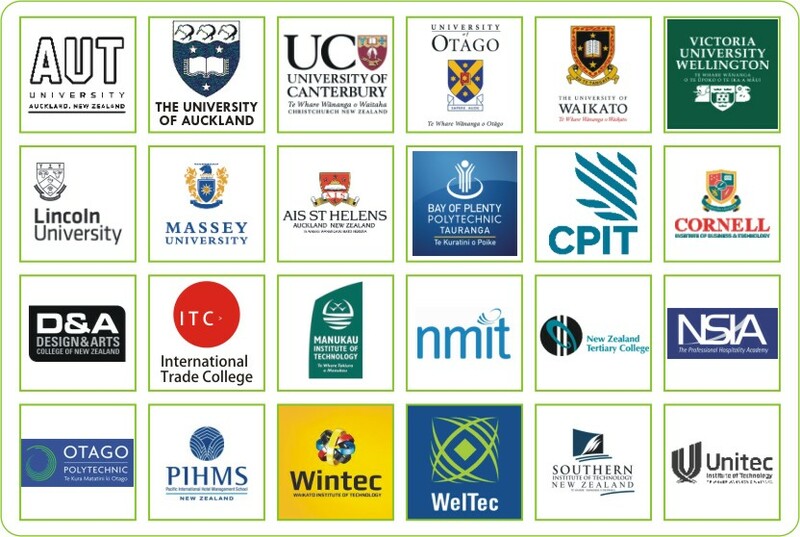 The institutions are diverse in size and location, and offer a wide range of general and specialist courses available for academic, professional and vocational studies at New Zealand institutions – universities, polytechnics and institutes of technology, colleges of education, secondary schools and private training establishments. New Zealanders are famed for their friendliness, hospitality and warmth to overseas visitors which includes International students. • New Zealand offers a safe and stable democratic political environment than elsewhere. Instances of corruption are virtually unheard of. There is no have abject poverty or hunger, pollution, congestion, health issues and cramped city living. • Tertiary Education at universities and/or polytechnics. • NQF is a unified system of national qualifications in schools, vocational education and training institutes located across New Zealand including its provinces. • The levels do not equate to ‘years spent learning’ but reflect the content of the qualification. • Subjects are broad in scope and range including subjects such as commerce, science and arts, etc. • University education from New Zealand is internationally recognized with many Graduates from New Zealand universities embarking on a brilliant career pathway globally. • Some institutions offer Year 1 of a Degree Program, with subsequent years being completed at a university. • Diverse range of subjects include: art, hospitality industry, computer studies, secretarial studies, quality management, ecotourism, etc. Living Expenses: Approximately NZ$1250 per month, and depending upon your lifestyle – austere, normal, rich, extravagant or lavish! These are usually located on campus or nearby, with single or twin rooms. Bed linen and cleaning are provided. Meals are eaten in a communal dining hall, with special dietary needs catered for. A warden lives on-site and social and sporting activities are organized for residents. Hostels usually have computer labs and recreation rooms. Some institutions provide self-catering hostels where 6 to 8 students have their own bedrooms and share a kitchen and living room. This gets you a room in a suburban house, usually with a garden and lawns. Your host family provides meals. Interacting with your host family and meeting their neighbours and friends is an excellent way to improve your English. Your host family will help you adjust to life in New Zealand. Homestay is not like living in a hotel. Some ‘give and take’ is expected, as you become part of the family. Renting a house or flat (apartment) on your own or with other people is called ‘flatting’. You choose your own flat mates in accommodation, ranging from a two-bedroom apartment to a large house on its own land. Most rental properties are unfurnished, apart from an oven, a laundry, curtains and carpet. A bond of up to 4 weeks’ rent is held by Tenancy Services and refunded when you move out, if the flat is still in good condition. The accommodation office at your tertiary institution will probably have a notice board with advertisements for flats. Newspaper classifieds list rental properties, especially on Wednesday and Saturdays. There are also several websites that list rental accommodation throughout New Zealand. The New Zealand government requires that all international students in New Zealand have an appropriate medical and travel insurance for their entire duration of study in New Zealand. Students need medical insurance to cover all treatments, including doctors, hospitals, ambulance and specialist students. International students can visit the doctor at the student health centre in their institution to get treatment for a very reasonable fee. This is not usually included in the Medical Insurance and not provided at the Institution’s Student Health Centre. International Students have to visit private dental care practitioners for dental care problems. It is advisable to take a different insurance that covers Dental Care also to avoid huge cost on Dental Care treatment. New Zealand provides a no-fault personal injury cover to all its citizens and temporary visitors to New Zealand which includes International Students. This special type of insurance is highly popular as it covers medical and dental treatment, prescribed medications, X-rays, and surgery for injuries caused by accidents by anyone at any place. Due to the wide range of help available after injury under this scheme, no one can be sued for personal injury in New Zealand. The academic year is from mid / late February to early November of every year. Most universities have 2 semesters with a holiday of 4 weeks in June. It is quite common to see that different universities have different dates in their Intake months. Some universities also offer summer school in the main holiday period. Intakes are also offered in February, and July and sometimes even in September by a few universities. • A band score of 6.0 – 6.5 in IELTS for Undergraduate course is needed. • A band score of 6.5 – 7.5 in IELTS for Postgraduate courses is needed. Resume, Statement of Purpose, Mark-sheets and Certificates of Class X, XII, till Graduation or relevant Degree transcripts in specific cases, Certificates of Extra-curricular activities, passport copy, birth certificate and 2 reference letters from colleges (for students) and 2 reference letters from employers (for working students). The visa processing time for applications is 21 to 25 days. During this process embassy may contact to ask for any further information if required. you are applying from outside New Zealand, evidence that you/your family have sufficient funds to pay your tuition fees after your visa application is approved in principle. To find out how much the fee is and where to send your application, use our office and fees finder at www.immigration.govt.nz/fees. After sending the Payment receipt to the High Commission, the student’s passport will be stamped and returned back. It is strongly recommended to give IELTS although it is not mandatory. • Eligible student’s partner may apply for a work permit too, valid for the duration of the study course. This is Graduate Job Search Visa of one year which allows international students who have graduated with NZ qualification to apply for this post study work visa. Upon finding employment during this period student can apply for NZ immigration to have this work visa extended for 2 more years. There is no requirement of job offer for this Graduate Job search visa. Student can apply for this visa within 3 month of completion of study or can take 6 month if have obtained PhD. After completion of first Post-study work visa (open), if student complete a second or higher qualification which is either a New Zealand bachelor degree or post-graduate qualification for at least one year then there is another opportunity for student to obtain second Post-study work visa (open). To apply for PSW student must have at least NZ$4,200 available to manage living cost in NZ.